Built by EDWARD the third is together with Seven other Castles taken from Draughts now remaining among the Records of the Dutchy of Lancaster (by the Permission of the most Noble JOHN Duke of RUTLAND, Chancellor of the Dutchy) Copied and Engrav’d at the Expence of the Society of Antiquaries, London, 1734. View of Lancaster Castle engraved by George Vertue after a drawing from the reign of Queen Elizabeth. The original drawings belonged to a cache of nine Elizabethan drawings of castles held by the office of the Duchy of Lancaster. The medieval castle of Lancaster as it appeared in 1561 when Ambrose Cave, chancellor of the Duchy of Lancaster, ordered it to be surveyed along with the other properties of the duchy. The castle is dominated by the keep in its centre to which is attached a slim staircase turret. Proceeding clockwise from the gatehouse, the engraving shows the Dungeon Tower and Adrian’s Tower, the living quarters (pictured to the right of the keep), and the Well Tower in front of the keep. Also shown is Lancaster Priory Church, which is located next to the castle on the summit of the castle hill, a bridge that crosses the River Lune, and a few houses that belong to Skerton. Lancaster Castle and the Priory Church are located on the summit of the castle hill on the western edge of Lancaster, overlooking the River Lune. Archaeological remains show that Agricola erected a fort on this hill in AD 79, which was later replaced by a cavalry garrison. The history of Lancaster Castle begins in 1093 when Roger of Poitou, a kinsman of King William Rufus and the son of Roger, earl of Shrewsbury, a cousin of William the Conqueror, built a stronghold on the site of the Roman fort. A year later, he established a Benedictine priory which was, however, not the first house of religious worship on the hill: there are records of a minster church consecrated in 630 AD and of several Saxon churches built in the early medieval period (Lucas 2014: 132). As part of the Honour of Lancaster, the castle passed back into the hands of Henry II in the middle of the twelfth century, which is also the period to which most modern accounts date the erection of the keep. The complex was expanded under King John and Henry III and by the middle of the thirteenth century the surrounding curtain walls, Adrian’s Tower, the Dungeon Tower, and the Well Tower, had been built. The gatehouse with the semi-octagonal towers that is also pictured in the engraving was begun under Henry IV and finished under Henry V in the early fifteenth century (Champness 1993: 9-10). Among the parts of the medieval castle surviving today are the gatehouse, the keep, Adrian’s Tower and the Well Tower, but the look of the architectural ensemble of the castle was altered significantly when extensions and new buildings were added in the eighteenth and nineteenth centuries to ensure that the castle could be used more efficiently as penitentiary, a function which it served until 2011. In a meeting that took place on 20 April 1732, the Society of Antiquaries decided to commission George Vertue to engrave the drawing of Lancaster Castle along with seven other sixteenth-century drawings of castles in the Duchy of Lancaster (SAL Minutes I: 288). Smart Lethieullier’s discovery of these drawings during a visit to the duchy office is discussed in more detail in the commentary on Plate XXXIX and Plate XL. Vertue brought a draft of his drawing of Lancaster Castle, based on the original drawing, to a meeting of the society on 24 January 1734 (SAL Minutes II: 27). A proof print was approved on 4 July 1734 and “[i]t was ordered that Each Member have three Prints […] delivered to him” (SAL Minutes II: 45). Although the print-run of this plate is not mentioned in the minute books, it is very likely that Vertue produced 100 prints, the same number of prints that were ordered for another engraving of the series (the plate of Knaresborough Castle, see SAL Minutes II: 78). The society gifted two prints of Lancaster Castle, together with two prints each of the plates showing the castles of Pontefract and Knaresborough, to the Duke of Rutland, the Chancellor of the Duchy of Lancaster, who had granted the society permission to copy and engrave the drawings (SAL Minutes II: 150). 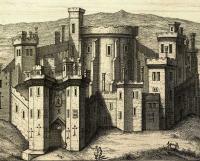 The original 1561 drawing of Lancaster Castle, which measured 52.5 cm x 118 cm, is held by the National Archives (TNA MFC 1/207) and a comparison with Vertue’s engraving reveals that instead of producing a faithful copy of the work of the sixteenth-century artist, Vertue made a number of alterations. In the original drawing, a crowded jumble of houses in the foreground indicates the proximity between the western edge of the town of Lancaster and castle hill. Perhaps Vertue felt that including the townscape would distract from the castle as the main subject of the picture: in any case, he omitted the town and brought the baseline forward so that the famous fifteenth-century gatehouse, popularly known as John of Gaunt’s gatehouse, is in the foreground of the picture. Vertue also inserted a number of human figures: a pair of visitors who inspect the castle, pointing towards it, and a horse carriage and several small groups of people walking on the path that leads from the Parish Church to the Lune bridge. As a result, Vertue’s composition highlights the attraction of the castle as a destination for domestic tourists, situating it in a landscape that is rendered more pleasant and picturesque than in the original. Vertue also made an attempt to correct the original artist’s limited skill in perspectival drawing. The sixteenth-century drawing shows little regard for perspective: the different parts of the castle – towers, curtain walls, and gatehouse all occupy roughly the same plane. Vertue used shading to create a clearer sense of the relationship between the different parts of the building and to imitate the play of shadow and light. In the process, he introduced an error: Vertue’s shading makes the Norman keep, square in the original, look circular (or rounded, at least) in the engraving. It is impossible to know if the members of the Society of Antiquaries, who approved the drawing on which the engraving is based, failed to catch this error or maybe did not regard this imprecision as a problem. The square shape of the keep of Lancaster Castle is clearly visible in two contemporary prints produced by Samuel and Nathaniel Buck which were likely familiar to some society members (Buck 1728). Besides its imposing position and views, Lancaster Castle was of interest to antiquaries because it was connected to a number of important historical figures and events. The castle had served as a seat of administration for the Lancaster inheritance (gifted by Henry III to his son Edmund in 1265) and continued to serve as such for the Duchy of Lancaster (into which the Lancaster inheritance, along with other estates, was subsumed over the course of the fourteenth century). The history of the Duchy began in 1351 when Edward III made Henry Grosmont, the 3rd Earl of Lancaster, the Duke of Lancaster and raised Lancaster to a County Palatine. In doing so, he gave Henry sovereign rights in the administration and jurisdiction of the county. However, in popular memory the history of the Duchy – and of Lancaster castle as its central seat of power – was much more closely linked to John of Gaunt, who became the 2nd Duke of Lancaster in 1362 (a title which was also granted to his male heirs) and who added a significant number of new estates to the Duchy. A history of the Duchy, entitled An Account of the Beginning and Erection of the Duchy and County Palatine of Lancaster (1735), that is roughly contemporary to Vertue’s prints, begins the history of the Duchy with John of Gaunt and leaves out all earlier events (Anon. 1735: 3). The impressive gatehouse of Lancaster castle was widely believed to have been built under John of Gaunt when in fact it was erected under Henry IV and Henry V. Indeed, in 1822 a statue of John of Gaunt was placed in the canopied niche above the entrance of the gatehouse (the empty niche can clearly be seen in Vertue’s engraving) where it remains today. Another feature of the castle’s architecture that visiting antiquaries must have taken note of was a stone in the battlement on the northern wall of the keep inscribed “E.R. 1585 R.A.” (E.R. presumably referring to Eliza Regina and the initials R.A. to Richard Assheton who served as High Sheriff of Lancashire in 1585), a reminder that the keep had undergone large-scale renovation during the reign of Elizabeth, when the threat of an invasion by the Spanish Armada loomed large (Clark 1807: 20). The juridical history of the castle stretches back to the thirteenth century, when it had first been used as court and prison. In the early eighteenth century, when Vertue engraved the drawing, the castle was remembered in particular as the site of the notorious witch trials that had taken place there during the Lancaster Assizes in August 1612. The trials were still well-known more than a century later because they had been documented in much detail in a publication authored by the clerk to the Lancaster Assizes, Thomas Pott’s The Wonderfull Discoverie of Witches in the Countie of Lancaster (1613). The trials also had a vivid afterlife on the stage. Thomas Heywood and Richard Brome wrote The Late Lancashire Witches (1634) while a new witch trial, that recalled the events of 1612, was under way in Lancaster. Thomas Shadwell drew on the play by Heywood and Brome when he wrote his comedy The Lancashire Witches, and Tegue O Divelly the Irish Priest (1681). Shadwell’s play featured a witch named “Mother Demdike”, who was based on Elizabeth Southern, matriarch of the Demdike family, who was found guilty of witchcraft during the 1612 Assizes at Lancaster castle and executed. Written during the turbulent years of the Popish Plot and the Exclusion Crisis, Shadwell’s play was a spirited defense of Whig politics, but the popularity of the play outlived the fraught political moment from which it emerged. In the early decades of the eighteenth century, the Lancaster witches could be seen on the Drury Lane stage and two editions of the play appeared in 1718 and 1736 respectively. In the meantime, Assizes continued to be held at the castle and it was used as county gaol, as the expanded 1753 edition of Daniel Defoe’s Tour thro’ the Whole Island of Great Britain notes (Defoe 1753 III: 253). In the late eighteenth century, the appearance of the castle began to change considerably as Thomas Harrison added new assize buildings, including the Crown Court and the Shire Hall (finished in 1801) to the west of the keep. New wards were built for male prisoners between 1794 and 1796, and the medieval hall of the castle was demolished in 1796. Finished in 1821, the female penitentiary was the last major extension; it was built according to a panopticon design by Joseph Gandy, who had also completed the Shire Hall begun by Harrison (Hartwell and Pevsner 2009: 374-79). The Gothic revival provided key inspiration for Harrison’s and Gandy’s redesign of the castle – an architectural choice that was applauded by Ann Radcliffe, who visited Lancaster Castle in 1794 and noted that “considerable additions are building in the Gothic style, which, when time shall have shaded the stone, will harmonize well with the venerable towers and gate-house of the old structure” (Radcliffe 1795: 378). Lancaster served as court and prison until it was decommissioned in 2011, but it also continued to attract visitors and tourists as is illustrated by the large number of guidebooks to the castle churned out throughout the nineteenth and twentieth centuries. 1735. An Account of the Beginning and Erection of the Duchy and County Palatine of Lancaster. Derby: Drewry. Buck, Samuel and Nathaniel. 1728. ‘The North East Prospect of Lancaster’, included in the first set of Buck’s Cities, Sea-ports and Capital Towns. BL Cartographic Items Maps K.Top.18.70.b. ---- 1728. ‘The South-East View of Lancaster Castle’, plate 6 in Perspective Views of the Remains of the under-named Palaces, Monasteries, Castles, &c. in England and Wales. BL Cartographic Items Maps K.Top.18.70.d. Champness, John. 1993. Lancaster Castle: A Brief History. Preston: Lancashire County Books. Clark, Christopher. 1807. An Historical and Descriptive Account of Lancaster. Lancaster: Clark. Defoe, Daniel. 1753. A Tour Thro’ the Whole Island of Great Britain […] With very great Additions, Improvements, and Corrections; which Bring it Down to the Year 1753. 5th edn. London. Fiennes, Celia. 1888. Through England on a Side Saddle in the Time of William and Mary: Being the Diary of Celia Fiennes. London: Leadenhall Press. Hartwell, Clare and Nikolaus Pevsner. 2009. Lancashire: North. New Haven: Yale University Press. Lucas, Adam. 2014. Ecclesiastical Lordship, Seigneurial Power and the Commercialization of Milling in Medieval England. New York: Routledge. Potts, Thomas. 1613. The Wonderfull Discoverie of Witches in the Countie of Lancaster: With the Arraignement and Triall of Nineteene Notorious Witches, at the Assizes and general Gaole deliuerie, holden at the Castle of Lancaster. London: Stansby. Shadwell, Thomas. 1718. The Lancashire Witches, and Tegue O Divelly the Irish Priest: A Comedy As Is Acted at the Theatre-Royal in Drury Lane. 2nd edn. London: Knapton. Survey and drawing of Lancaster Castle, Lancashire. 1561. The National Archives, Kew. MFC 1/207. Radcliffe, Ann. 1795. A Journey Made in the Summer of 1794. London: Robinson.